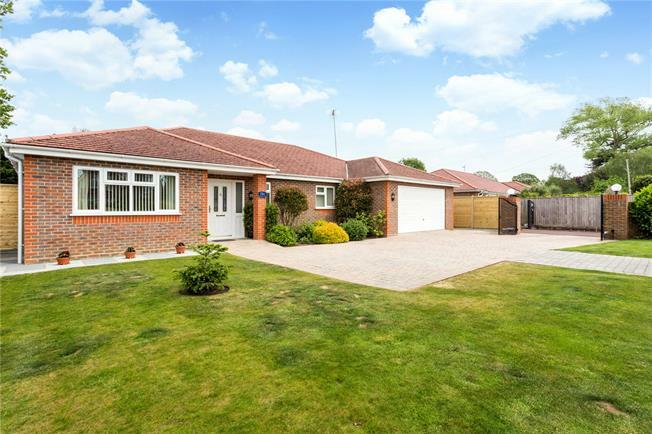 3 Bedroom Bungalow For Sale in Bognor Regis for Asking Price £625,000. A delightful three bedroom, detached bungalow with modern and contemporary features. Pine Lodge is situated behind private electric gates with intercom to the bungalow and comprises 1,957 sqft/181.8 sqm of accommodation (including the garage). To the front of the property is an L shaped hallway that provides access to light, airy rooms all of which offer plenty of storage space. The open plan kitchen/dining room features a central island with a polished granite work top, an array of integral appliances, and French doors leading to the rear garden. The living room also has French doors leading to the garden along with a fully working gas fire. The master bedroom allows for plenty of natural light and has an en-suite shower room. The two other bedrooms share the family bathroom. The grounds are fully enclosed by a brick wall with electric metal gates opening to the block paved driveway to the front of the property, which allows parking for numerous vehicles and access to the integral double garage, which has an electric up and over door. The gardens are a particular feature of the property, with access on the right hand side of the property to the rear gardens. The main lawn is bordered by flower beds as well as a variety of mature shrubs. The garden enjoys an outdoor sitting area and patio area. Pathways lead around the gardens to the summerhouse which is multi-purpose and offers ample storage space.